I have been thinking of my Grandma Jahr for the last two days about nonstop.I don’t know why except that it is Lent and it reminded me of a story I tell about her.I want my grandkids to know what kind of person she was.I believe she is my reason for sanity and she was an amazing woman.She wasn’t afraid of anything and I want my grandkids to feel that way about me.She was sensible about most things but sometimes she sent me into orbit with some of her decisions and this is one of the reasons why. After my Grandpa Jahr died my Grandma’s life changed.They lived a very structured life.She made every meal they ever ate and going out to eat was a rare treat.She now had more time to do things that she never had time to do when she was a farmers wife.I talked to her every day after I got out of work and she started to socialize with her widow friends more.Her best friend was Madeline Menzel and Madeline’s husband had passed away also.I never really liked Madeline much because she always seemed kind of mean but Grandma and her were friends since grade school days.They would go shopping and visiting other widows and I was glad she had someone to spend time with when I was at work.I would hear about their adventures after I got home and it was nothing for my ear to be sore after a talk with Grandma on the phone and this day was no exception. I think I was home about five minutes when the phone rang and it was Grandma. My Grandma had a habit of putting the word THE in front of a lot of words.Like she always said cream of the mushroom soup.I loved it when she said stuff like that and I remember smiling when she said the Big John’s.It was a little restaurant in Caro about a half hour away from her house and I thought it was nice they went out to lunch together on a Wednesday. The Curry’s were Grandma’s neighbors and Mrs.Curry did Grandma’s hair.I’m sure she was discussing the bad fish and taking her time doing it. I was thinking thank God because you haven’t had a license in twenty years! My Grandma had to learn a lot of stuff after Grandpa died and she did.I taught her how to balance her checkbook and I helped her figure things out,but she taught me things until the very day she died.She wasn’t afraid of anything not even getting into a car with someone that shouldn’t be driving.I want to be like that for my grandkids.I want them to smile thinking of me like I am right now thinking of Grandma long after she is gone.I hope that they feel blessed to have had me and I hope that I drive them a little crazy too.I am thinking that’s what grandmas are supposed to do.Keep you on your toes. I can’t end without this.Grandma I love you still and thank you for everything you ever did for me.You were always ready for the challenge even if it was the death of a friend.I think of the lessons you taught me on how to protect myself from hellish stepfathers and where to kick them if they attacked.I remember to keep God foremost in my life and to teach my grandkids like you did me.I still hear your sweet voice and I will never forget it.If mean Madeline made it to where you are I hope you and her are having a good time and that the fish is good. 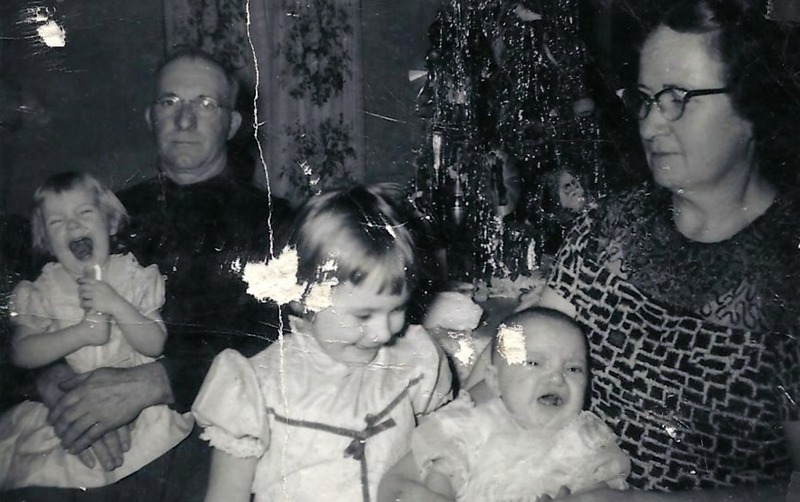 This is Grandma and Grandpa.My sister Linda on Grandpa’s lap and my sister Lori in Grandma’s arms.That’s me standing in the middle. This entry was posted in Life and tagged death, fish, grandma, growing up, Lent. Bookmark the permalink. A farmer’s wife would have to be able to think ahead in adversity, takng her friend’s death in stride, working on the next task – getting home! I’m glad you had this amazing woman in your life, and can now share her with your grandkids, and with us! She was like that.You hit the nail on the head.Nothing fazed her and she just did what had to be done.If I had problems she knew just what to do.I remember one time we were having trouble with one of the stepdads and she came over with a horse whip ready to take care of him! Your grandma had quite a way of telling a story! “Madeline picked me up, we went out to eat, the fish was bad, I’m going to feed it to the cats, oh and I saw the Curry’s, and by the way, Madeline dropped dead!” She certainly knew how to build up to the climax! As my grandma would have said, “What a corker!” I can’t define that exactly, but I think it translates to “What a character!” What a wonderful story to preserve for your grandkids! She was that for sure and for some reason I can’t quit thinking about her saying the fish was bad before she told me her friend died.I remember calling my sister Linda and wanting to tell her the story just as Grandma told me because I just couldn’t believe her. She sounds like a real character. I find it interesting how blase she is about her friend dying. She is more worried about getting home and bad fish. Was English her native language? She was a character.I believe her first language was German although she was born here in Michigan.Her and my Grandpa always spoke German and so did my mom. Thanks Sue.I have been having some issues lately and hope I have them behind me.Thank goodness that Grandma kept bugging me in my mind this past week.Hugs right back at you my friend. Every word of it is exactly how it happened.You can’t make stuff like that up and I want my grandkids to have a little piece of Elsie Jahr,Grandma of all times! Dilly??? Was that her nickname for you? Oh, this was such a great story!!! I’ve been wondering where you have been! I love how after the husbands are gone the ladies really live it up…going out with their girlfriends and doing lunch…my Grandma was the same way! These are the kind of stories if not told, disappear. What a great memory, even if the fish was bad and mean Madeline met her Maker. Thank you so much for sharing it with us! This is hilarious! Thank you! Thank you!! Thanks for the kind words.I remember being so shocked but after we hung up the phone and I started telling the story to my sister Linda we were laughing too.I mean a lot of laughing! I was still scared because she was in the car with MM but that was Grandma! Great piece of storytelling 😀 The fish was bad was more important than your granma’s childhood friend dying outside the restaurant! You’re lucky to have had such a great person in your life! I know I am blessed to have had her and I still smile thinking about some of the things she did to me.Blessings to you. Wonderful post. You’re such a good storyteller, and I’m glad I got to know, through your words, this person. Thank you for sharing it with all of us. All the best. 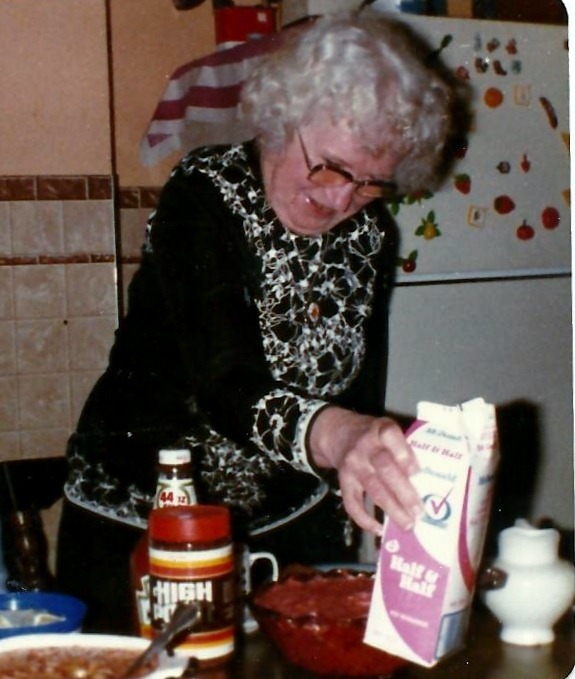 It is easy to tell a story when you have good material.I am glad you get a glimpse of my grandma too.She was a farm woman and very simple and would never believe that she is out here in blogsphere with pictures and everything.Thank you for the kind words. do you like that video because of marshmellow or the doughnut? cause if it was because of marshmellow then i can write another post with a video of marshmellow! well not a video of it exactly. but a video with it in it. (i am not sure if marshmellow is a bow or a girl. that is why i put it). just write to me in my comments the answer! I love the photos of your Grandma. She sounds like quite the lady! Thank you, she was. I was so blessed to have her in my life. What a wonderful Grandma, I am sure she is proud of you. thank you for saying that. I know I was very blessed to have her.